Calculate math operations, like whether a number is prime. Bring information from the web, like a bank account balance. Stream live data, like a stock price. Machine Learning functions can be created by AI developers, including data scientists and other experts. The functions are each based on a service that calculates or predicts values with a machine learning model. Once the model is deployed, the creators can enable it for anyone they choose. Within a company, administrators can configure who has access to which proprietary functions. Then, every time someone wants to run the function, they simply type in a cell, just like for any other Excel function. The function calls a live web service on the company’s Azure subscription and returns the result asynchronously. Smart forecasting, like predicting the future revenue trend at a company based on time series data in Excel. Classification problems for many Excel rows, like fraud detection from credit card transactions. Any custom Python code, like a function to analyze text in cells. 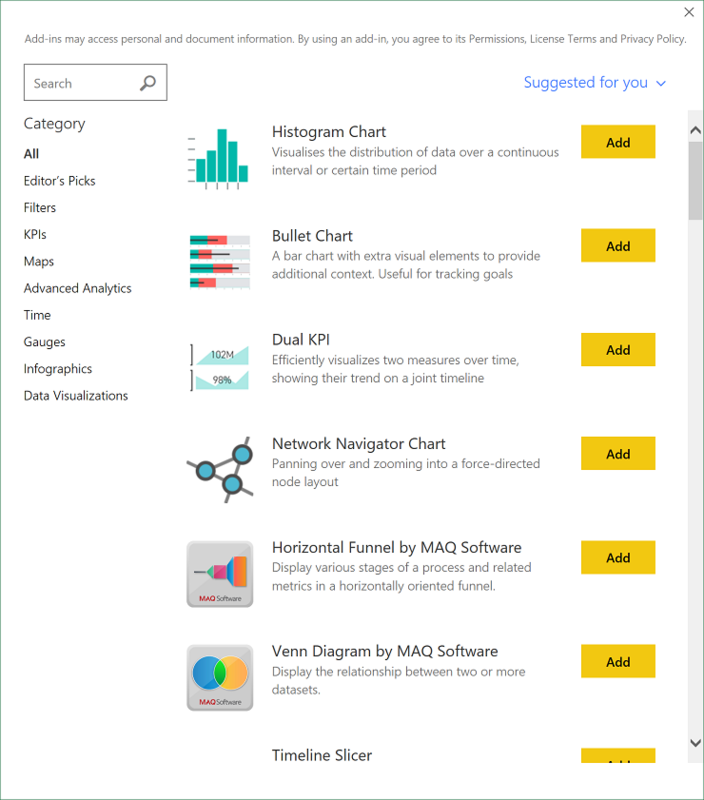 Power BI Custom Visuals for developers and power users. 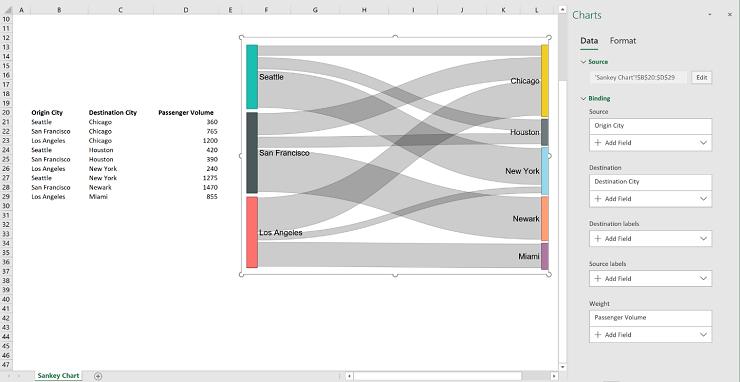 Examples from rich third-party ecosystem of Power BI Custom Visuals in Excel. Intuitive insertion experience: Custom Visuals live alongside existing charts in Excel. There are new entry points in the Chart ribbon, as well as a dedicated tab in the Insert Chart Insert dialog. The result is a familiar experience for users. Tailored Office Store experience: Like Office add-Ins, Custom Visuals can be published to the Microsoft Store. Exploring new charting options in the store is a one-click tailored experience that lets users navigate directly to a set of Custom Visuals. Intuitive UI controls: Excel provides common UI helping users connect visuals to their spreadsheet data, as well as configure properties. Providing this UI gives users consistent experience across all visuals. And having ready-made controls saves development time, allowing developers to stay focused on the visual content itself. Enterprise ready: Not all Custom Visuals are meant for the public Microsoft Store. Enterprise developers can continue building visuals in-house for their specific line-of-business needs (such as, for example, an airline company building a custom “airplane visual” for displaying information about seat booking). Office 365 admins will have the ability to deploy visuals in the same way that Office add-ins are deployed, and those new chart types will appear in the Insert Chart Insert dialog automatically without any additional work needed by users. Customs Visuals live with other Excel charts. Visuals acquired from the store, or those deployed by an Office 365 administrator, will automatically appear here. The store for Custom Visuals can also be launched from here Note, these visuals are just examples of the types of visuals in the Office App Store. Excel provides a tailored view of the Office App Store that lets you focus on just the Custom Visuals. 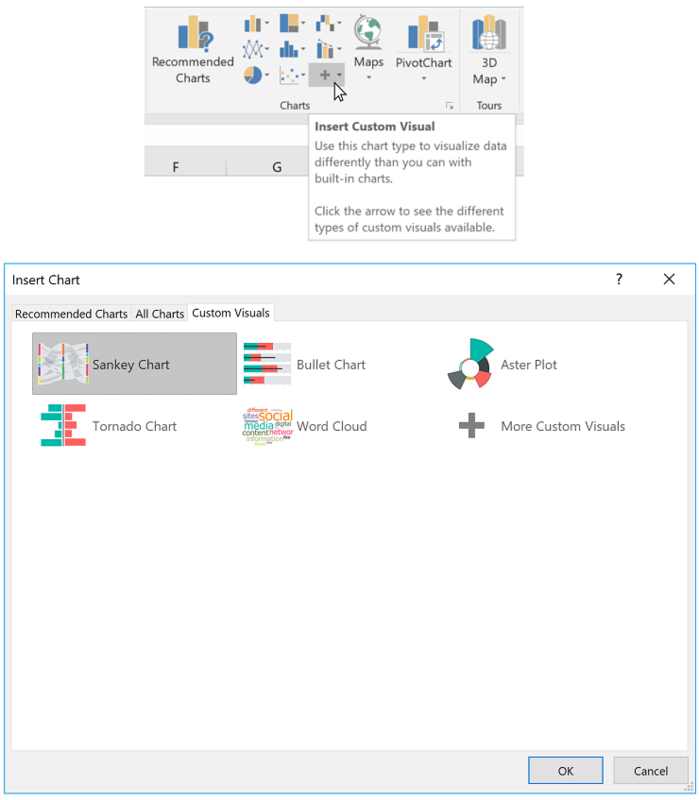 Note, the example visuals shown here are existing Custom Visuals for Power BI and may not all be available in Excel. The task pane helps users connect their Custom Visuals to spreadsheet data, as well as configure settings on the visual. The same task pane appears for all visuals, making the user experience easy and familiar for users across all visuals. The combination of a more tightly integrated experience together with a customized store and a consistent UX, will give data visualization developers maximum reach to their audience. For more information, visit API documentation for Custom Visuals to get started today writing visuals for Power BI. Visit the Custom Visuals Store to see what kinds of visuals are currently offered. With this integration, users can create, manage, and most importantly run automated workflows on Excel tabular data. 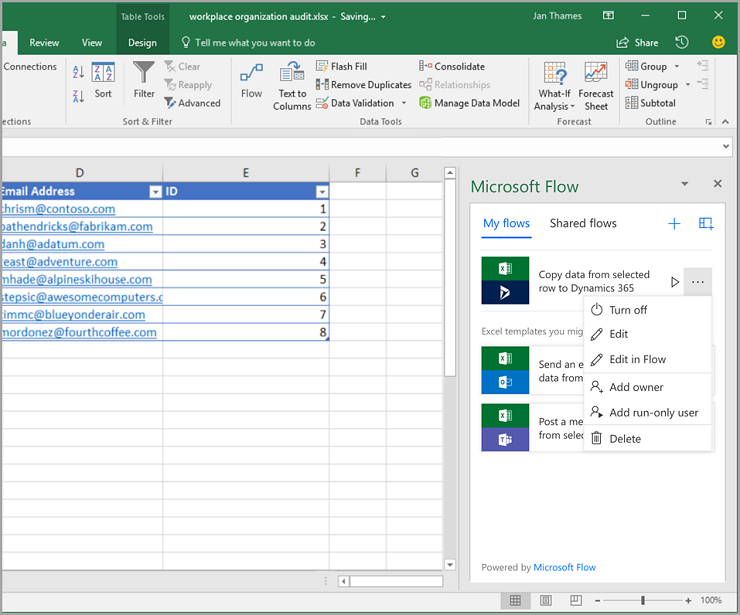 Via Flow, users will be able to send data from their spreadsheets hosted in SharePoint and OneDrive for Business to a wide range of services such as Teams, Dynamics 365, Visual Studio Online, Twitter, etc. The integration will first be shipped as an add-in in the Office Store and will become an in-the-box component later this year. These new capabilities are the result of continuous innovation to make Excel a more flexible and intuitive data analysis tool and expand developer opportunities. To stay connected to Excel and its community, read Excel blog posts, and send us ideas and suggestions for the next version of Excel through our UserVoice. You can also follow Excel on Facebook and Twitter. Interested developers can sign up here to get updates as custom visuals becomes available.